Both the teams are in the contention for the remaining 3 spots for the semi-final. Every match from here on will be thrilling and exciting as all the teams except Perth Scorchers are trying to qualify for the playoffs. This match will be played in the home ground of the Melbourne at Docklands Stadium on 30th of Jan so they might have upper hand. Melbourne Renegades have announced 2 changes in their 13 men squad, Cameron White and Mennie with Wildermuth and Holland. Sydney Thunders have also some forced changes keeper Matt Gilkes has been replaced by 19-year-old Baxter Holt who will debut tomorrow and Jono Cook and Arjun Nair have both been recalled to the squad while Sam Rainbird misses out. Sydney Thunders will be full of confidence as they have defeated Perth Scorchers, thanks to Callum Ferguson who has played innings of his life of 113. Their bowling looks pretty strong but they have some issue to address in the middle order. With an out form Devcich, Daniel Sams, Jason Sangha, and Chris Green making up the middle-order, it is very much down to the top-order batsmen to score the bulk of the runs. 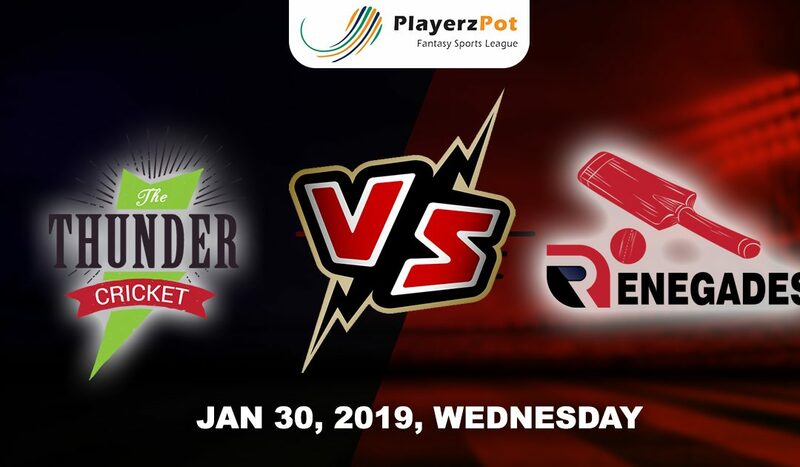 Melbourne Renegades will win this match as they have much better balance in their team.